Cory Fulton Lidle (March 22, 1972 – October 11, 2006) was an American professional baseball player. A right-handed pitcher, Lidle spent nine seasons in Major League Baseball with seven different teams. Lidle was killed when the small aircraft he owned crashed into a residential building in New York City. Lidle graduated from South Hills High School in West Covina, California in 1990 and was signed in 1990 by the Minnesota Twins as an amateur free agent. After his release in 1993, he was signed by the Milwaukee Brewers. Due to his participation as a replacement player during the 1994 Major League Baseball strike, he was ineligible to join the MLB Players Union. He was then traded in 1996 to the New York Mets, with whom he made his major league debut on May 8, 1997. Lidle later appeared for the Tampa Bay Devil Rays, Oakland Athletics, Toronto Blue Jays, Cincinnati Reds, Philadelphia Phillies and New York Yankees. His best season was 2001, when he achieved a 13-6 record with a 3.59 ERA (10th in the American League) for Oakland, helping the Athletics win the wild card. His career zenith occurred in August 2002, when he gave up only one run during the whole month (setting Oakland's record for consecutive innings without an earned run), won all five of his starts, and was one of the prime movers in the A's historic run of 20 straight wins. It was on this Oakland team where he earned the nickname "Snacks", for his apparent love of "inhaling" junk food in the bullpen. In 2007, Lidle was posthumously inducted into the Binghamton Baseball Shrine since he had played for the Double-A Binghamton Mets (New York Mets). On July 30, 2006, Lidle was traded along with outfielder Bobby Abreu from the Philadelphia Phillies to the New York Yankees for minor league shortstop C. J. Henry, the Yankees' first round pick in the 2005 draft, along with left-handed reliever Matt Smith, minor league catcher Jesús Sánchez, and minor league right-hander Carlos Monasterios. After being traded, he criticized his former team: "On the days I'm pitching, it's almost a coin flip as to know if the guys behind me are going to be there to play 100 percent." He noted he was joining a Yankee team that expects to win all the time: "That's why I'm most excited about it. Sometimes I felt I got caught up kind of going into the clubhouse nonchalantly sometimes, because all the other guys in the clubhouse didn't go there with one goal in mind." In his first start for the Yankees, he went six innings, giving up one run on four hits, en route to an 8-1 Yankee victory as part of a sweep against the Toronto Blue Jays. On August 21, 2006, he went six three-hit shutout innings, completing an improbable five-game sweep (in four days) over the then second place Boston Red Sox (who went from 1 1⁄2 games behind to 6 1⁄2 games behind). On October 7, in his final game (Game 4 of the 2006 ALDS), he lasted only an inning and a third, allowing three earned runs on four hits as the Yankees lost to the Detroit Tigers, 8-3. He was criticized for telling a reporter, "We got matched up with a team that, I think, was a little more ready to play than we were," which was taken by some as a jab at manager Joe Torre. For damage control, he called the radio talk show Mike and the Mad Dog and gave an extended defense of himself and the Yankees. The snippy exchange was punctuated by co-host Chris Russo's implication that Lidle was not entitled to "enjoy a day in New York" and co-host Mike Francesa commenting, "I haven't thought much about you at all, to be honest with you." Following reports of his death, both hosts of the popular New York radio show expressed remorse for their hostility to him. Lidle threw an 88–90 mph fastball with cut and sink. He threw a low-70s curveball to keep hitters off balance, and a low-80s slider. He was a finesse pitcher who had to rely on changing speeds and pinpoint location. On October 11, 2006, Lidle and co-pilot/flight instructor Tyler Stanger were flying a Cirrus SR20 airplane when it crashed into the Belaire Apartments complex at 527 East 72nd Street on New York City's Upper East Side, killing them both. The plane was flying above the East River past the Queensboro Bridge toward restricted airspace. A strong wind from the east due to an incoming front caused the plane to be blown into the building as it was making a 180-degree turn. In addition to the deaths of Lidle and Stanger, 21 were injured in the accident, about half of them New York City firefighters. Lidle was the third Yankee to die in a plane crash. The prior two were catcher Thurman Munson (on August 2, 1979) and pitcher Jim Hardin (on March 9, 1991). Yankees owner George Steinbrenner described Lidle's death as a "terrible and shocking tragedy that has stunned the entire Yankees organization" and offered his condolences to Lidle's wife and six-year-old son. On October 12, 2006, before the 2006 NLCS game in New York City between the New York Mets and the St. Louis Cardinals, both teams and all spectators observed a moment of silence in Lidle's memory. The Yankees wore black armbands during the entire 2007 season in memory of Lidle. On April 2, 2007, Cory's widow Melanie and his son Christopher both threw the ceremonial first pitch on Opening Day at Yankee Stadium. Melanie Lidle attended the 2007 graduation ceremony at Mt. San Antonio College in Walnut, California. The community college's aviation team flew across the graduation field during the ceremony to pay respect to both Lidle and Stanger. Lidle is buried in Forest Lawn Memorial Park - Covina Hills, in Covina, California. One of the baseball fields at West Covina's Cortez Park is named "Cory Lidle Field" in his memory. Lidle's twin brother, Kevin, also played baseball, as a catcher for several minor league teams. He was a descendant of Robert Fulton, the inventor of the steamboat, as reflected in his middle name. ↑ Michael Urban, "Chavez clutch in A's 17th straight" from MLB.com, August 31, 2002. ↑ Slusser, Susan (October 12, 2006). "The A's remember the man they fondly called 'Snacks'". San Francisco Chronicle. pp. A–14. Retrieved April 16, 2008. ↑ Associated Press, "Lidle backs off criticism, but Rhodes keeps firing" from ESPN.com, August 2, 2006. 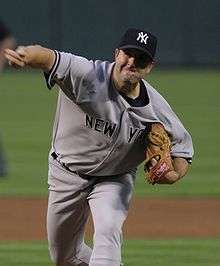 ↑ Associated Press, "Lidle pitches in Yankees sweep from Boston.com, August 4, 2006. ↑ ESPN Wire Services, "Yanks finish Boston beatdown, sweep five-game series" from ESPN.com, August 21, 2006. ↑ Tyler Kepner, "Lidle Had Passion for Flying, and for Speaking His Mind" from the New York Times, October 12, 2006. ↑ Neil Best, "Francesa feels haunted by Lidle interview" from Newsday, October 12, 2006. ↑ Andrew Marchand, "Interview got ugly" from the New York Post, October 12, 2006. ↑ "Yankees pitcher killed in crash of small plane in Manhattan". CNN. October 12, 2006. Archived from the original on April 15, 2009. Retrieved May 8, 2009. ↑ "Update on Cirrus Plane Crash in Manhattan, New York". NTSB. November 3, 2006. Archived from the original on May 14, 2009. Retrieved May 8, 2009. ↑ "Woman Burned in NYC Plane Crash Released". Fox News. Associated Press. November 10, 2006. Archived from the original on July 11, 2011. Retrieved May 8, 2009. ↑ ALCS Game 3 on Friday afternoon; NLCS Game 2 at night, Associated Press. October 12, 2006. ↑ "Yankees to honor Lidle with armband". The Sports Network. February 15, 2007.